What is it about great works of art and their power to move us? In this series, experts in different art forms (music, dance, the visual arts) will talk about some of their favourite works, exploring the 'wow factor' and considering new developments in showcasing these works. Series Coordinators: Tom Burri and Ellen Lewis (with thanks to the Kitchener-Waterloo Third Age Learning Network). 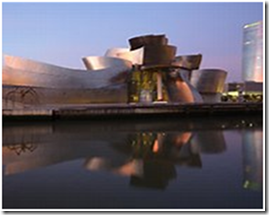 Since Gehry’s Guggenheim Bilbao opened in 1997, architectural spectacle has been used to attract audiences. This talk will look at some Canadian and international marvels of museum architecture but will also examine how museums are grappling with a vastly shifting demographic, the influx of technology and an increasingly global conversation about relevance. Click here to evaluate this lecture. Stuart Reid is an award-winning writer and curator with over twenty five years of experience in public art museums. He is a former president of the Ontario Association of Art Galleries. The proliferation of contemporary art Biennales and the popularity of Nuit Blanche suggests that extravagant and event-driven exhibitions can create new audiences and interest in contemporary art. A closer look will explore both professional and populist engagement and probe whether this phenomenon leads to spectacular art or to spectacles only. Corinna Ghaznavi is a curator and freelance writer living in Grey County. Since 1997, she has curated exhibitions across Canada and in the Netherlands. Her writing has been published in Canadian and European art magazines and numerous exhibition catalogues. Bach's Cantata 140, "Wachet auf," is one of his best-known and best-loved cantatas based on the popular hymn of the same name. Bach composed it, as he did all his church cantatas, to bring that Sunday's Gospel readings to life and to comment on their significance for its listeners. Kenneth Hull is Associate Professor of Music, Conrad Grebel University College, University of Waterloo, Artistic Director of Spiritus Ensemble, a choral-orchestral group that performs mainly the music of J.S. Bach. WAS PRESENTED ON MONDAY MARCH 11, 2019. Brahms' Symphony #4 was a challenge to the expressive trajectory expected in minor key symphonies, a tradition established by Beethoven in his Fifth and Ninth symphonies. This tradition was followed by every important minor key symphony after Beethoven until Brahms subverted it in his Fourth Symphony eighty years later. We will explore the meaning of these great works by Bach and Brahms - and their power to move us through recorded excerpts and by examining relationships between music, text, story and cultural context. A challenging work of dance and music for 20th and 21st century choreographers, Stravinsky’s bold, folkloric score was accompanied by Vaslav Nijinsky’s radical choreography, while painter Nicholas Roerich’s scenic design evoked ancient hills and spring rituals. At the 1913 premiere the audience booed and hissed. The ballet Rite of Spring was remounted in the 1980s for New York’s Joffrey Ballet. Having created Rite Redux with York U colleagues Anderson will offer insights into its musical and choreographic challenges. Carol Anderson is a Professor Emerita, York University, Department of Dance, choreographer, dance artist and author. One of James Kudelka’s most enduringly potent ballets, In Paradisum (1984) was created with Les Grands Ballets Canadiens. Anderson will discuss Kudelka as choreographer, embracing artistic direction of a myriad of aspects – music, costume, performance, lighting, and staging – that create a distinctive work of dance. Video clips and insights into the alchemy of collaboration will show why In Paradisum ‘works’, and how the dance language, musical score, costumes, scenography, and dancers weave together.